Considerations on certain types of refractors. Different types of refracting telescopes. 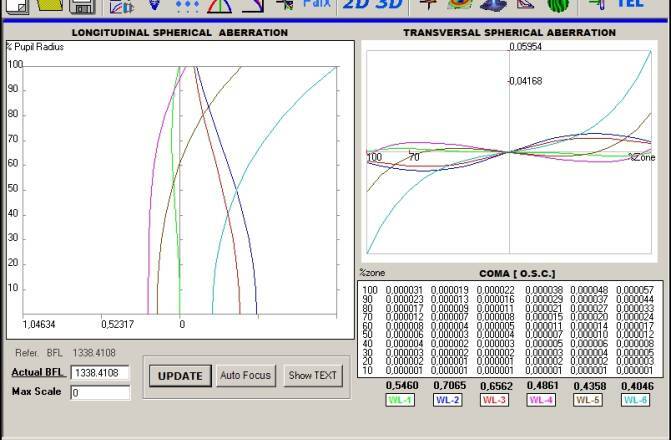 The purpose of this dissertation is to provide some basic indications on how to approach the design of certain types of refractors without going into detailed analysis of the calculations themselves. Let us start from the classic doublet refractor where the choice of glasses depends only on their cost, which must be as low as possible, and by the Abbe number which must have at least 25-30 points difference between the two glasses (ordinary crown and flint glasses) so as not to have the internal curvature radii too accentuated (e.g. the classic BK7 + F2). The situation is though different if we want to make an apochromatic doublet. 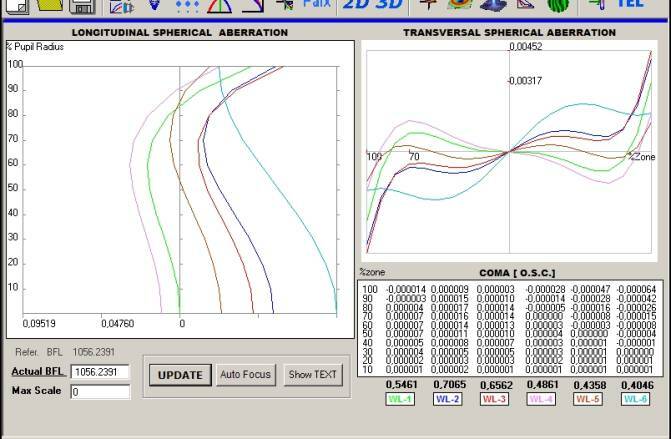 In this case, having got hold of the various glasses catalogues, it is necessary to identify those glasses which have an equal or almost equal dispersion ratio, namely: Px˜Py (with P= (ne-nc)/(nf-nc)). Personally, I created a database using all the optical glasses catalogues that I could find and sorted them in descending order of P, so that any identical ?? (or almost identical) values with their Abbe number jump immediately to the eye making it is easy to match them. Among these values ? ?we will search for a glass whose Abbe number is much higher in comparison to the average of the others and with a refractive index much lower than the others; what we have now found is an anomalous dispersion glass which is ideal for the construction of apochromatic systems. 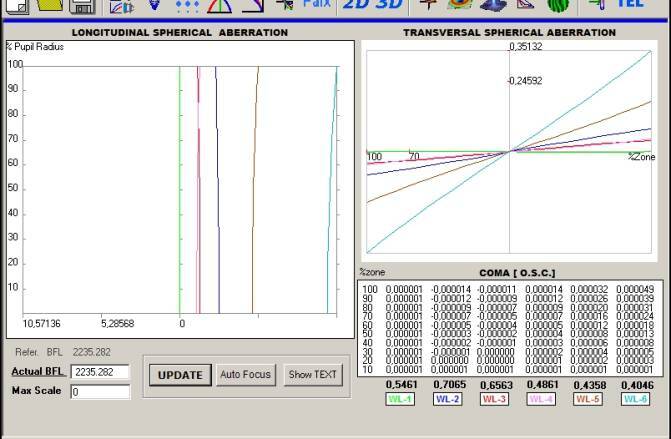 At this point we need to calculate the objective lens that we want to make by means of an analytical calculation program or, even better, with the software available on the market today. With the same two glasses we can design a triplet by dividing the ordinary glass lens into the two lenses: one at the front and one at the back to sandwich the anomalous dispersion glass therebetween. 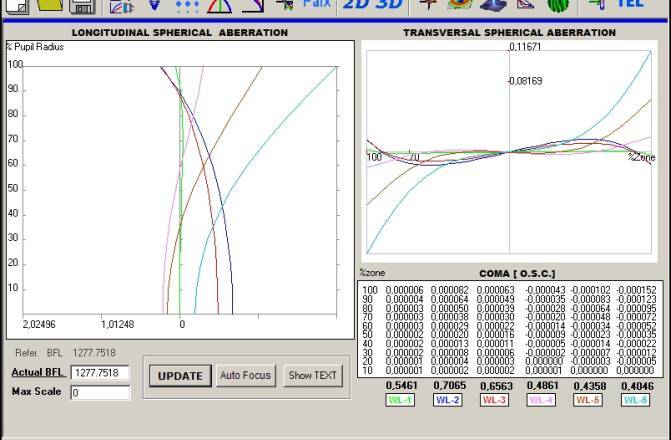 In this way we obtain two curvature radii and an extra thickness that serve to improve the characteristics of the initial doublet. Then there is also another way, i.e. three glasses different from each other. In this regard, there is remarkable study by Max Herzberger and Nancy R. McClure, “The design of super-acromatic lenses”, on super-acromatic three lenses objectives that are ? ?not necessarily made with fluorite or FPL53. Incidentally, all my research was based on this study. In principle, without going into detail, the study establishes that there must be a linearity in the dispersion relations of the three glasses (two dispersion relations for the same glass). After having created an x-y graph with these values, if by joining their points to each other we obtain a straight line, we have found three glasses suitable for a super-acromatic triplet. The Abbe numbers will obviously have to differ from each other by a certain value, with the result that the greater the difference between the Abbe numbers of the three glass, the greater is the possibility to push the focal ratio up. I think that Christen used this study to make his first f/10 apo triplet using KzFS-1 as the middle glass. 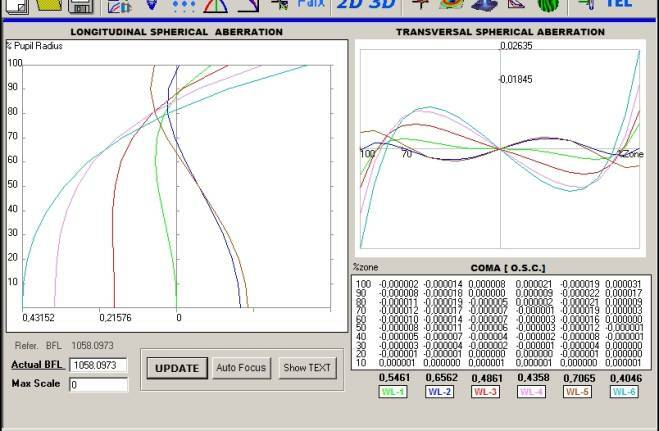 “Apochromatic is an objective corrected parfocally for three widely spaced wavelengths and corrected for spherical aberration and coma for two of them”. 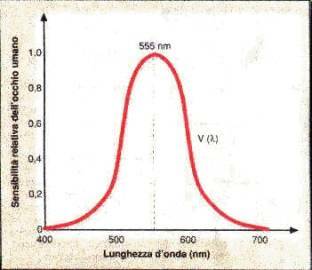 I would like to point out that with widely spaced are meant the extremes of the visible spectrum and, to make it simpler, the graphs below refer to all of the visible wavelengths between 706 nm and 404 nm and to objectives with a 150 mm diameter. 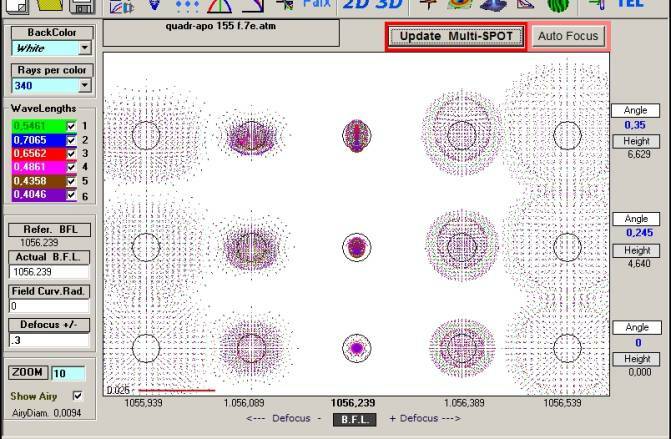 Below, placed in succession, are all graphs of the apo doublets: FPL51 f/9 doublet; FPL53 f/8 doublet; fluorite f/8 doublet. FPL51 f/8.5, FPL53 f/7, KzFS-1 f/10; the latter is one of the many that I found by following the footsteps of Max Herzberger combining a flint glass, a barium crown glass and a dense barium crown glass. This f/12 triplet, always of 150 mm diameter, is designed with ordinary glasses (one crown and two flint ordinary glasses) and it is the result, together with several others, of my last research conducted at the end of 2012. 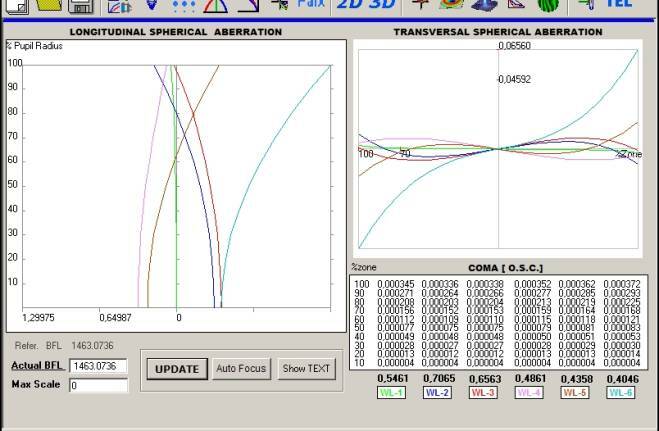 As it can be seen, even if there are no anomalous dispersion glasses, its focal ratio allows it to be compared –in terms of chromatic correction– to some of the better-known lenses made with exotic glasses (it is perfectly corrected for at least 4 wavelengths). f/12 Triplet with ordinary glasses (one crown and two flint ordinary glasses); research year 2012. As it can be seen, they all are corrected for the coma at all wavelengths. Therefore, it is the spherical aberration the most difficult to correct because also in the apochromatics there remains a small residue, that in the quadruplet assumes a really low value. All this in accordance with the numerical calculations, but if we now look at the sensitivity curve of the human eye, we can see a sharp decline right towards the extremes of the spectrum. Visually, we can consequently consider apochromatic those objectives which are within a narrower range, say from 656 nm to 436 nm, and perhaps even less. As a result, also with the f/10 triplet and the FPL51 doublet, even though the extreme 404 nm line is beyond control, it will be visually virtually invisible. That said, it is not so easy to check the chromatic correction of a commercial refractor since you would need to know the types of glass composing it and then disassemble it in order to measure its curves and thicknesses, so that all data can then be entered into the optics analysis software. 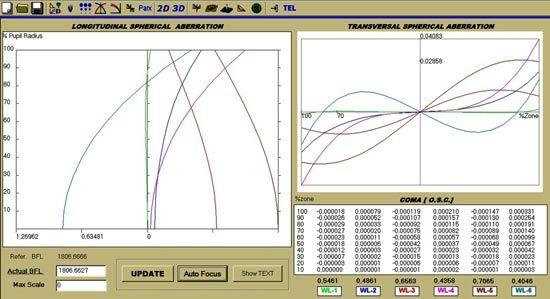 As for the lower sensitivity to the seeing of long focals (or better to say, depth of focus), I created four multi-spot graphs that may well explain this phenomenon. (1) The Airy disk size is: 0,0288 in the f/20 doublet; 0.0108 in the fluorite f/8 doublet; 0.0094 in the f/7 triplet and f/7 quadruplet. (2) The f/20 doublet has a nearly constant defocus, while those with f/7 and f/8 have such an accurate focus that as soon as you move everything increases enormously in comparison to the Airy disk. Unauthorised reproduction is prohibited. The author is available to answer questions and comment further this topic, both privately and through the NortheK forum.